The CGSI Conference ended yesterday evening and I finally have a chance to sit down and write at least few sentences... I originally planned to write two blog posts from the Conference, but with five lectures (three presentations and two workshops) I had no chance to do so. I came in Pittsburgh on Monday late evening (and I almost missed my flight from NY as we had 3 hours delay on flight from Prague to NY, Delta even rebooked my flight to the morning as I had 1 hour in NY which most of people think impossible to change the flights after coming from EU - well, I did it! ;) ) and was welcomed by Paul Makousky, for what I'm really grateful. There was registration running during Wednesday afternoon and a huge number of people came to greet me and tell me they are really happy to finally meet me in person - and believe me, I'm so happy I had the chance to meet all of you! First Kurrent workshop took place on Thursday afternoon and it turned out great (and I even gave them a homework ;) ). Second workshop was on Saturday morning (like in 7:30, which was definitely tough for some of the people attending) and we had some really interesting discoveries there. I did translation sessions, answered questions about the Czech surnames, talked to so many people about their family history... What I'm really sorry about is the fact that I was not able to get to Michal Razus's, Jim Hudec's or Helmuth Schneider's presentations - but I'll definitely do that next time. I attended the Parade of Kroj and the Slavjane dancing group show and it was great to see the heritage of our ancestors is still alive here in the U.S. (I'm writing this post on Sunday morning, waiting for my flight back home). 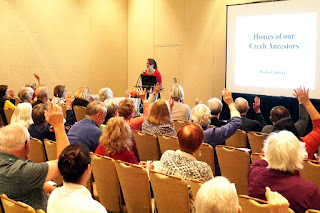 I will prepare two blog posts that will introduce you the case studies I did as a part of "After the roof" Surnames and Estate Registers presentations - case study of Zetík or Justýn family for household surnames and case study of Dlabal or Krátoška family for estate registers. I'm really happy I had a chance to meet you all - and see you in Lincoln, Nebraska in 2019! All your presentations and the Kurrent workshop were helpful, informative, entertaining - and your ability to switch horses in midstream, as we say, and create in less than 24 hours a session on the seignorial registers is amazing! No one attending coffee have guessed that you hadn't given that presentation in English before, it was so well done! Thanks for coming! It would be wonderful if these presentations could be preserved online so that they could be shared with others who could not attend. I would be happy to pay a small fee to view each one! See Mary Jane's post just below. We would love to have you as a part of CGSI. It was an honor to introduce you at two of your presentations. You are incredibly talented at researching and presenting, and you are a wonderful help to so many people. I hope to see you again in Lincoln. Thanks a lot, Mary Jane, it was a pleasure to meet you. Looking forward to the 2019 Conference in Lincoln! It was great to meet you - and I'm so glad I found people of the same sense of humor. ;) See you in 2019! I loved your 'After the Roof' class Blanka, you gave an excellent presentation and I learned so much, even going back over it later to learn more. Thanks for all of the work you do and I hope to get to meet you when our paths cross somewhere. I live in Australia and it was not possible for me to attend the conference which I hear was wonderful. I am sure all presentations were interesting and full of information. Would it be at all possible to write a blog about "Life in Bohemia and Moravia in the 18th century", it would be so interesting to get an insight into the home lives of our ancestors. Thank you for your interesting and informative blogs from which I have learnt so much. Was great to meet you at the CGSI conference. Great job on the Kurrent workshop and your many presentations. Sorry I missed your Estate Registers presentation, but I was across the hall giving one of mine. I look forward to your blog on that topic and will check out the video recording on the CGSI website when it becomes available. Look forward to seeing you again in 2019 at the CGSI Conference in Nebraska.